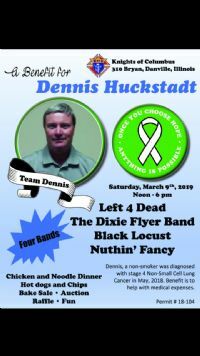 Dennis our Financial Secretary is suffering from stage 4 lung cancer and this benefit in the month of Founders Day will edify many of the principles Fr. Michael McGivney believed when he founded the Knights of Columbus in New Haven, Connecticut. The benefit will be Noon to 6:00pm. There will be 4 bands, food for purchase, silent and live auction, 50/50, bake sale, etc. Please plan to attend or donate to this event to help benefit our Financial Secretary with his ongoing medical bills.